Compacting the wall rock behind your retaining wall, as well as inside the cores of the facing units is key. 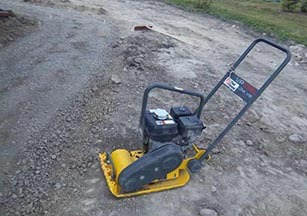 Allan Block recommends that a hand operated plate compactor be used behind the base course within the 3 ft (0.9 m) wide consolidation zone with a minimum of two passes. Compaction of the second course and above begins by running the plate compactor directly on top of the block facing and then compacting in parallel paths from the wall face until the entire consolidation zone has been compacted. A minimum of two passes of the plate compactor are required with maximum lifts of 8 in. (20 cm).